Award winning dining arm chairs. 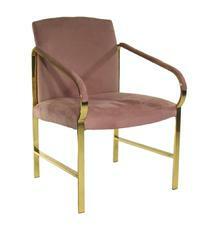 Mauve ultrasuede over brass frame. Excellent original condition, the chairs show extremely well. Heavy and sturdy. Brass has only the most minimal of oxidation and no pitting. Fabric is in excellent condition. Burn mark to one arm. These chairs are in the finish and fabric as originally displayed by Baker in their High Point, NC showroom and as in the national advertising campaign. Scroll to bottom for extensive documentation of these chairs. The above photo was taken at Baker's High Point, NC Showroom. Our chairs are identical to these in both frame and fabric. This photo is prominently used in the "Contemporary Collection" catalog, and also in the national advertising campaign Baker used to launch Bert England's new collection. The above illustration is the line drawing for the Baker catalog index. chair design in Baker's "Contemporary Collection"
HIGH POINT, N.C. ALTHOUGH most companies at the Southern Furniture Market, which ends tomorrow, put up an optimistic front, the overall slackness in the American furniture industry was indicated by near— empty showrooms. ''I'm not sure that the wheel should be reinvented every time, but this is a limp show,'' said Lu Wendel Lyndon, one of the owners of Placewares, a Boston-based retail furnishings company. One reason given for the exceptional quietness was that the semiannual show of new furniture was scheduled two weeks earlier than usual. Some manufacturers had not had enough time to prepare new prototypes. But there were a few new ideas and an indication that contemporary furnishings - one hesitates to use the word modern - were finally being accepted in a field that basically champions antiquereproduction styles. ''There is a decided movement into contemporary and modern where function and simplicity of design are the overall criteria,'' said John Budd, senior vice president of Kaufmann's, a Pittsburgh department store. Country, casual and contemporary - those passepartout decorating terms -seemed more interchangeable than ever at this market. Raymor/Moreddi, a company that is more often associated with plastic and chrome, showed lots of wicker and wood. Included were Ed Sicon's pleasant wood-grid coffee tables and bar carts for Taylor Woodcraft and Ed Whiting's cane chairs for Vermont Tubbs - new, but perhaps unnecessary versions of the company's classic snowshoe pieces. Also noteworthy at Raymor/ Moreddi was a new, pale palette -sweet pink, cool green, sky blue - for its range of plastic storage elements. ''He started the trend, now it's spread like a disease,'' said Jim Block, a sales representative for Raymor/Moreddi, of George Beylerian, one of his competitors. Beylerian also showed one of the freshest designs at the market. Designed by Dan Droz, the ''Popsicle'' is a table base made of wood units that look like ice cream sticks but pivot out to support a table top. It will retail for $79. The appearance of well-priced, modern designs - few and far between as they were - was heartening. Ingo Maurer's ''Bulb Bulb'' was a star. Made of polystyrene, the lamp is a giant unshaded light bulb, and a new version of the Munich-based designer's smaller glass-globed ''Edison'' lamp. Many of the wide-armed, round-shaped pieces are upholstered in cotton velvet of lime, lilac and teal blue. ''The softness and tactile quality of the fabric is part of this look,'' he said. The Art Deco style was strong at Swaim Originals, where John Mascheroni, the designer-in-residence, denied that Art Deco had peaked as a revival style. ''It's just beginning to really penetrate,'' he said. One popular leitmotif at the show was the roll-top. Drexel-Heritage incorporated a tambour unit as part of a headboard; Lea Industries showed others on futuristic, although flimsy, children's storage components, and Design Institute America used tambours on wall systems, as well as on desk-like units to house home computers. The development of smaller mechanisms for folding beds - as well as the demand for extra sleeping accommodations in today's smaller living spaces - has prompted many manufacturers to come up with alternatives to the sleep-sofa. Throughout the show, beds popped out of coffee tables, hassocks and chaises, and they seemed to test the laws of elementary geometry by unfolding from round and diamond-shaped couches. Selig's hassock concealed a double bed that also fit under a low Parsons table. Spherical's channel-quilted chaise had a mattress that unfolded to provide a narrow bed. It will retail for $249. ''It's not for every night, but for occasional sleeping,'' said Bruce Shelton, the president of the company. Robert Tiffany presented ''Waves,'' a series of curved chaises at Sherwood. Flip-up pillows fold back and over to convert the units to beds. 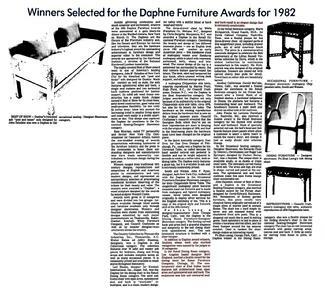 ''It's off-the-floor to attract serious sleepers,'' said Mr. Tiffany, a pioneer designer of chameleon-type furniture. 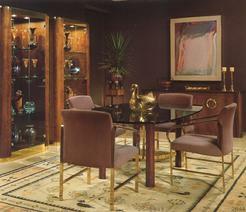 A new collection by Bert England was shown at Baker Furniture. ''Not extreme and recognizable to most people,'' William Barborka, director of advertising, said of the concern's East Indian laurel wood cabinets, tables, upholstered chairs, benches and sofas. Here contemporary has been translated in a collection that was distinctly Oriental. Upholstery Systems was one of the manufacturers that took the easy way out as far as originality was concerned. Three of its new products were line-for-line copies of the Conran's ''Club'' series of chair, love seat and three-seater sofa. Upholstery Systems's club chair will retail for about $400, the love seat for $600, the sofa for $700 to $800. Conran's prices are $535, $890 and $1,075, respectively. Upholstery Systems also has a hybrid design copied from Italian sofas by Paolo Nava and Antonio Citterio for Flexform and Paolo Piva for B&B. But the biggest letdown was Lea Industries' which presented its ''Magic Kingdom Collection'' of children's furniture, based on Walt Disney amusement park themes. The seven groups were decorated with details recalling different park rides and environments. It was a heavy-handed treatment of what could have been a good idea. The only successful items were the wooden cutout accessories - a Mickey Mouse coat rack, a Goofy holding a laundry bag and the Magic Kingdom Castle headboard. ''Instead of being joyous, it's sad,'' said Paola Navone, a Milanese architect who said he also happened to be a longtime Mickey Mouse aficionado.